Just a few weeks after learning about mushrooms at the VNPS Workshop, Plants and Their Friends: Exploring Partnerships Above and Below Ground, I got out of my car, wandered across to see what was blooming in the front yard. There, in bloom, was a wood poppy that a friend had given us a few years before. It had languished in too much shade, or so I posited, and I moved it last fall to what I hoped would be a better spot. Success! Nothing makes a gardener happier. But then, on the way from the driveway to the front door, I spotted this! A morel, of unknown provenance. It’s never been spotted here (in our yard) before, in 28 years – of course, it is a little camo. I searched my memory, trying to remember if I bought morel seeds at Home Depot last fall, but I drew a blank. When I told my husband, who had been at the VNPS Workshop with me, he said, “Oh, that’s just the above-ground fungal reproductive structure. As they say, the tip of the iceberg.” Wow. So, we’re waiting to see if it’s going to be eaten (squirrel? deer? neighbor? ), and whether others will peek up, or if there will be even more next year. John Hayden, our VNPS Botany Chair had this taxonomic note to add to the story. 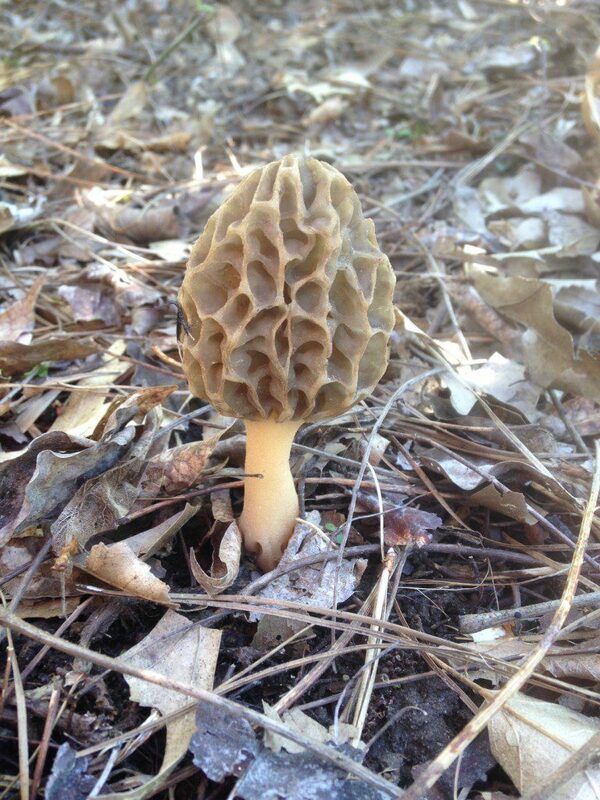 The morel, (Morchella esculenta), is edible, and highly prized. Whereas must macrofungi are Basidiomycetes, morels are Ascomycetes. There are multiple differences, a prominent one having to do with the details of how the spores are made. Each concave depression on the surface of the morel contains the cells that make spores. Basidiomycete fungi make their spores along the surface of paper-thin gills, or along the surface of tunnel-like pores, or in large internal masses (as in a puffball), or on the surface of coral-like branches. What? You couldn’t see the gnomes and fairies? Me too! About 2 weeks ago we found 3 morels in the backyard. We’ve been here 30 years and never before! So cool and delicious. I was told cut don’t pull if you want to eat them.